New Providence High School students have been working hard to prepare for ‘Spirit Week". 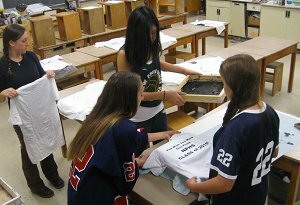 The annual event involves all of the school"s classes, who exhibit their school spirit by wearing class t-shirts, decorating the school building, and creating spirit posters. marketed and sold by the students with the help of their class advisors, art teachers Ms. Eileen Mondino and Mr. Bill Vivona. In addition, in the class of 2015 designed and painted signs that will be used to decorate the freshman hallway.